I have recently been thinking about the pros and cons of blogs, chatrooms, Facebook and Twitter. What need does each fulfill? What need does each block? After some contemplation, which those of you who know me well enough to know was very deep indeed, I decided that the ability to converse in a back and forth manner was a big pro of Twitter, but the ability to converse at length and with thought was a big pro of chatrooms and blogs. So...I'm endeavoring, in my own way, to create the best of all possible worlds, and allow conversation and thought to mate on my blog. Bear with me as I try this out and refine it as I go. Feel free to make suggestions and thanks for participating. Yesterday, on Twitter, someone (and I'm sorry I forget who) linked to a video of Seth Godin talking about tribes. Then, today Sarah of Slouching Mom selected phalanx (def. : noun, 1. any closely grouped mass of people: a solid phalanx of reporters and photographers; 2. a number of people united for a common purpose) which I thought was a really, really interesting concept to consider within the context of the Internet, specifically as it applies to social media. It's easy to think of mommybloggers as a phalanx---aren't we united in common purpose? To share and create a community---hopefully one that pays dividends in some form or offers remuneration, more preferably? (Stefania at CityMama eloquently describes her journey from casual blogger to professional blogger and marketer.) Aren't we all trying to do the same thing? Commune with other moms, shares tips and tricks, and make a living for our families? To be a true phalanx, in my opinion, all the mommybloggers would have to be unified behind a single blogger or project. Our goal would have to be that this person’s or blog’s single goal succeeds. And we don't all want that. We don't all want the same thing. We want what we want for ourselves, which is, of course, personal success (however you might define that). However, in order to succeed online, I need for this medium to succeed and be a place that facilitates success, and that is the point on which we converge. Seth Godin says, "I don't want everyone to have a tribe. I only want the people who want the world to change, I only want people who have something to say, to make a change, to make things better...The world is lined up in a way now that instead of having to have power or cash, you can make change and have influence merely by leading people who want to go somewhere." This point is not lost---or invisible---to the marketing community. They are always after the influencers, and the influencers invariably have a tribe. What's new is people figuring out how to use these online influencers and tribes as an effective marketing stream. In the mommyblogging community, we talk (okay, kvetch) about how marketers reach out to us. At the recent Mom 2.0 Summit, there was a lot of talk about treating moms as if we are a single entity, unified by gender and mom status. What I think we're really talking about is phalanx versus tribe. Marketers need to understand that we're not a phalanx. We don't all have the same interests or a common, unifying goal---as much as it might appear we do. Instead, what marketers are actually seeing are alliances within tribes. These "cooperative effort alliances" work with an attitude of reciprocity, "you scratch my back and I'll scratch yours, and together we can get each other much further than we could on our own." Consider Cool Mom Picks, which reviews and promotes different products that can rapidly become The Mommy Must-Have. The Parent Bloggers Network also reviews products, but additionally provides space for networking. Most appealing to me is The Motherhood, which offers space to listen to conferences about gardening, pose questions to other mothers for answers and ideas, and more. The sites run the gamut from straight up marketing to focus on the conversation. What's important to me is that I know the purpose behind these sites, and it's to provide space and information. Sites such as Cool Mom Picks, while friendly and appealing, don't pretend to be my personal friend. It reminds me of a time my husband and I, newly married, met another young couple, who invited us to dinner. We'd wanted to meet other married couples, so we were thrilled at the possibility of new Married Friends. We were thrilled, that is, until, polished and wearing our "best but not trying too, too hard" outfits, they opened the door and invited us in to have a glass of wine and...listen to their Amway presentation. Suffice it to say, we didn't stay for dinner and never again spoke to them. It's just not a good way to initiate a relationship. It's also not a good way to use an existing relationship, as good a product or as well-intentioned as it might be. Bottom line for me is that I love recommendations from friends. That's probably my number one source of selecting products. I love when friends know information about the products and can answer questions. I don't love friends who consistently try to sell me on something when it's their job. In other words, I don't like to mix business and pleasure. I don't like heading to friends' blogs only to catch them hawking. I know when it's happening, even if it's a story about the fun times a couple has baking a cake with lots of bonding and laughs. Like Anne Shirley, I know when a story has been co-opted to sell Rollings Reliable Baking Soda, no matter how allegedly seamlessly it's been integrated into the tale. And for the record, I also notice the new prominently displayed labels on television shows. I'd rather commercials, if it's all the same to you, PR Firms. I'd rather not watch Debra Messing spend five minutes using the entire line of Oil of Olay products at the beginning of the Starter Wife. In fact, I am pretty good at tuning out or clicking away from advertising, especially when it intrudes on what I really went to see. The truth is, I plan my purchases. I do! When I want information about what to get? I go do my own research, usually on the Internet, and that's when I want to see reviews and details. When I want. When I ask. When I'm ready. I know that the point of advertising is supposed to be to make me think "Puffs!" when I need to buy tissues, but to tell the truth, it doesn't. I apparently have limited space in my short-term recall and I triage "make lunch for kids" and "dentist tomorrow at 9" as priorities for that space. When I go to the store, I weigh price point against alleged features splashed on the packaging. Sorry Puffs, you usually lose. But we keep talking about products. If we think back to Seth talking about people wanting to make the world better, that means this all applies to ideas, too. Again, this isn't a point lost on or invisible to issue advocates and politicians, who have also entered the social media arena. But are they using it effectively? And more importantly, are they using it appropriately? At the end of the day, I think the best avenue to success is not so much to form a tribe as it is to form a phalanx. It's tooting a horn in my own band, but I think the MOMocrats are one of the best examples of a phalanx on the Internet. This group of women united to not just advance women's voices and concerns in the political arena, but we joined forces under one common goal: get our political party elected into office. It worked, and what’s more, we all became much more active and a bigger part of the overall effort than I think we would have individually. This is where I drop off the presentation and ask you to join in the conversation. * Talk to me about what you think of bloggers who become vehicles for marketers---whether it's ideas or products---and whether any can or have seamlessly integrated "for profit" blogging into their main stream of blogging. * Talk to me about whether it's realistic to believe that integrating marketing into a personal blog can be seamless. Can it be, or is it invariably jarring and offputting, even if elegantly done? We're pretty sophisticated these days and I'm pretty sure we can smell marketing a mile away. What do you think? * How can this be something that provides that shiny dividend for us? What do you think as a reader and/or a writer, or even more specifically, as a marketer? P.S. Eventually I'll figure out how to set this up to feed from Twitter, and give everyone "permission" to talk in advance. I remember my Valentine's Day childhood parties well, even though these days it seems like a hundred years ago. I went to a lot of different elementary schools so the parties are distinct, rather than a blur of similarity of places and people. There were a lot of common points, though, regardless of place. We'd sit at our desks---the old-fashioned kind (now) with the wood top, attached by a metal bar to the hard, slick wood seat (one size fits all, hard for smaller bottoms). The cubby was underneath the seat, so children's heads tended to bob down as if going under water to get a fresh pencil. We'd have ants in our pants, the teacher would say, because not one of us could sit still. Every now and again a child, usually a boy, would explode up from his desk, no longer able to sit at all, and the teacher, resigned to this sort of thing, would say something like, "Mark...Mark, what are you doing up?" And poor Mark, a victim of a heady case of excitement beyond his control, would say, "I need to sharpen my pencil!" The teacher would say, "You sharpened that pencil two minutes ago." Mark would pause, scratch his head, shuffle for a reply. The kind teachers would give in, help him save face, and say, "Oh go ahead, sharpen it, but walk!" The room on those days would smell even more vividly of wood and lead shavings, overlaying the mingled odors of many thrilled children and the sharp acidic scent of chalk dust. At some point, a mom's face would appear in the door window, and the teacher would gesture for her to come in. Smiling, carrying a tray, the mom (and maybe one or two others at the suburban middle-class schools) would enter, slightly tentatively, unused to being in the classroom, their own childhoods and classroom experiences fresh on their memories. Smell is one of the best agents of memory, they say, and classrooms are so full of smells. "Where should we put this?" the mom would ask, and the teacher would gesture to the cleared reading table. The teacher lead the party in those days, when I was a child. The children waited at their desks, impatient and trying hard to listen to the directions. We smelled the cupcakes, or the cookies, and we knew that in the cubby under our desks were little boxes we'd painstakingly decorated, full of Valentine's we couldn't wait to hand out to our friends. The teacher would tell us to put our boxes on our desks, and then, in orderly lines, we were to walk up and down the rows dropping each Valentine into each box. Once finished, we sat back at our own chairs, and the moms wold start handing out the treats. In my mind, it was usually cupcakes, maybe because I love those best of all. While we ate, we go to read through our Valentine's. Back then, some were the store bought little paper ones, but at least half were still handmade. The store bought ones were considered cool...because they came printed, like formal cards, and had popular characters of the day on them. One year every single boy handed out Star Wars cards, with photos of a grave Luke wielding a light saber and stating, "May the force of love be with you." After cupcakes, and after we'd been instructed to put all our cards back in our boxes---mine always had a paper doily red heart, usually very similar to other kids because back then, we often decorated our boxes in class as an art project---to show our parents later, after the boxes were tucked back into our cubby under our desk...the teacher would hand out her gift, usually lollipops, the sort with a looped handle instead of a stick, the sort with blurry white printed messages on them. If you licked just enough but not too much, you could usually make out the "Happy Valentines!" message on it (no space for "day"). Sometimes one mom brought a box of Necco candy message hearts. I never liked this candy much, but I loved the secret messages on each one. Also, in late elementary school we had devised a fun game for those hearts. After the party, the teacher and moms would shoo the hyped up on sugar kids outside to run. We loved this extra recess and fun, plus the fact that normally it was forbidden added an element of extra thrill. The moms and teacher would stand on the side, sometimes nibbling on leftover cupcakes (or cookies) and chat, probably about how funny sugared up kids are or maybe reminiscing about their own childhood parties. 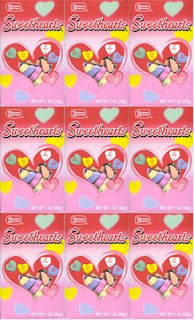 My friends and I would gather in a circle and show our hands, in which we had secretly clutched our candy hearts. "I got Be Mine," Lori triumphantly said. We all ooohed because that was the best one. "Be True," I said, slightly disappointed. "Kiss Me!" Kelly said happily. This was a big score for her, because it carried a huge fear factor. "I think mine says Call Me," Shannon said. We leaned in to try to read it, but couldn't quite agree, maybe out of sympathy for Shannon because Call Me was the worst one. "Wildcard," Lori announced, sure in her answer, positive we'd follow her lead. "Wildcard!" we cried and Shannon smiled. We all giggled and Shannon and Lori linked arms. "Okay," Kelly said, and we turned and ran. Shannon and Lori chased Mark and Chris, screaming, "BE MINE!!!" I ran after a random clutch of boys, shouting, "BE TRUE!" "KISS ME KISS ME KISS ME!" Kelly shrieked, clamboring up the slide. Whoever the Be Mine girls caught had to be theirs for the rest of the day, a slave to their whims. Lori caught Mark, and she demanded that he get on all fours and bark like a dog, which he readily---and happily---did. I caught Chris and made him eat the Be True candy, which acted as a truth serum in our game and meant he had to tell the truth the rest of the day. "Who is smarter?" I demanded, "Me or Kelly?" Kelly ran by just then. She yelled, "I am so KISS ME!" I noticed she didn't latch on to any one boy and simply caught and released them one by one. The boys ran, terrified and yet---underneath---thrilled when caught. After she released them, they were triumphant, "HA! I got away!" They'd run, taunting her to chase them again. Shannon tried to convince Mike to comply with the Be Mine demand, but he would not go along. When recess ended, we were exhausted and happy. We packed our bags to head home, enjoying the secret cards in our pretty boxes---something more interesting than the usual homework. It was the best day, and seemed a million miles in either direction from Christmas and Easter, both of which we openly celebrated at public schools back then. Holidays seem so different now. They are planned, more elaborate. The moms seem overly familiar with the classroom, and the teacher stands to the side, while the moms put the kids through activity paces on a timetable. Store bought cards are so de rigeur that fancy, crafty "scrapbooking moms" make beautiful homemade ones, and those carry cache. The teachers may hand out lollipops, but they are lost in the sea of lollipop bouquets, M&Ms, and Oriental Trading Co gift bags. The little Valentine's cards are carelessly tossed aside as impediments to the candy or gift. "Look honey," I try to capture my four year old's attention, "Look at the cute card from this friend!" "Another lollipop!" she says instead, "A heart with a heart drawn on it!" I sigh, and consider that her bounty is bountiful indeed. I recall keeping my box of Valentine's, with warm friendship wishes, under my bed for months. On down days, I'd take it out, and remember the fun, and the friendship. I have only sent my kids in with little cards. They are cool, the 3-D ones that change pictures, but there is no pencil, eraser or candy attached. Just a warm wish of friendship. At my younger daughter's party yesterday, I stood beside another mom who looked anxiously at the collection of elaborate Valentine's. "I only sent in little cards!" she said. "Me too," I said. The I thought how it was the babysitter, not me, who had helped my kids with their cards and boxes. Valentine's fell on a particularly crazy busy week this year, when my hands---and calendar---were overly full. My husband and I are delaying our own celebration until sometime in March, when things so far look calmer. We're so busy these days---the general us, I mean, as well as my family specifically---and we try so hard for the children, to make it incredibly exciting, this burst of attention and special day with fun event. For me, that meant squeezing in an attendance at the party on a day when I had deadlines. It was worth it when my daughter raced full speed ahead at me and slammed into my legs in joy. For others it meant sending in a fancy batch of Valentine's. "It's okay," I assured the other mom, "It all matters, and we all have different things we add in, all in different ways. After the candy is gone, my daughter will hang on to the cards, and she'll enjoy those for a long time to come." The other mom smiled at me, and I thought that's one thing that won't change: the children's anticipation of this day and event, and their joy and pleasure of it. It's only the next day, but the candy is already gone (eaten or ahem disposed of) and my daughter has lined up her cards on her little art table. She gazes at them, rearranges them, and touches them every time she passes by. That's another thing that never changes, either. Happy Valentine's Day. Be true.